Smartphones represent so much more than their antiquated name suggests. You can place calls, get online, find directions, look up nearly anything through Siri, contact authorities, play games, listen to music, read novels, and catch up on the latest shows. I remember how revolutionary MapQuest directions felt. A few years later, my clunky Garmin GPS felt like magic. Now, I open Google maps without even thinking, and just expect that it will take me anywhere that I want to go. The only downside I face now is where to put my phone when I am using it for directions. At least, that was the downside, until I discovered these fantastic cellphone holders for my car. This cell phone holder sits conveniently on your car’s vent. Considering that most cars are designed with vents front and center, this holder ensures that your smartphone is never too far out of sight or reach. It clips your phone in on three sides, all of which are padded. There is even a quick release button hidden on the back so that you don’t have to struggle with both hands every time you want to make a quick update to your itinerary. If you want a car holder that is sturdy and easy to set up/use, then this is the product to use. It is one of Amazon’s top products. Like the last entry, this phone holder fits snugly in your car vent. But instead of clipping your phone into this bad boy, you simply hold it in place above the circular pad, and magnets take over and hold your phone upright for you. All you have to do is put a thin metal disk inside your phone case. This holder is particularly nice for when you are not using your phone for directions, in that the magnetic disk is small and unobtrusive. You will no longer have to decide between a ride with limited AC, or a ride with directions/music/general entertainment. Unexpected bonuses? It is an Amazon Choice item and kind of looks like it is from the future. 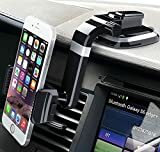 If you are not into blocking your air vents at all, but still want to be able to look at your phone while you are driving, then this phone holder that suctions right to the windshield is a great option for you. The suction cup allows you to secure it nearly anywhere on your windshield. Some opt for the center of the windshield, while others like it over on the driver’s left side. This particular holder clips your phone in on three sides so it won’t slide around or slip out of the grip. The eight-inch flexible arm means you can adjust your phone to best suit your driving position. The manufacturer calls it a “gooseneck” and promises that it “is rigid enough that it won’t move unless you want it to, while is flexible enough you can position it however you want. 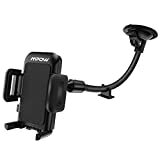 And the long gooseneck of Mpow Flex can bring the phone much closer to you, which makes it very versatile for a lot of different setup possibilities.” It is also an Amazon bestseller. This cell phone holder is unlike the others, in that it does not suspend your phone at all. Instead, the sticky mat sits right on your dashboard, and your smartphone leads up against a kickstand. 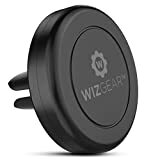 If you have found yourself retrieving phones that have fallen out of suspension holders, or just plain do not like the idea of blocking your air vents or a section of your windshield, this is a fantastic solution for you. The anti-slip silicon base of the stand will adhere to nearly any dashboard. There is a kickstand behind the phone for you to prop the phone up against, and two small brackets in front which stop the phone from sliding out of place. The manufacturers suggest that you prep the surface of your dashboard with a quick swipe of an alcoholic wipe that will help the mat adhere better. It promises that the silicone will not melt into your dash when the sun comes beaming into your car. As someone who has had to fish for their phone after a sharp turn or a stop caused it to fall from its suspended holder, this solution seems like a great fit. This car mount is interesting, as it combines suspension and gravity. The suction cup adheres directly to your dashboard. The arm swings down in front of your radio so that the phone clips actually sits below the dash. One of the benefits of this is the holder will not block your field of vision or your air vents. The phone clip snaps around the two long edges of your phone. It is also padded on either side to prevent scratches. The product even has a lifetime guarantee. The only downside is that the arm itself is not adjustable, thus this mount may not fit in every car. But if you drive a sedan and aren’t a fan of having your phone propped up on your dashboard, this is a great option. So grab a power bank, “start your route”, turn on some tunes, and hit the road. Never again will you have to worry about fumbling with your phone. The need to glance down every time you need to confirm your directions will be a thing of the past. With each and every one of these mounts, you can be hands-free with your chosen device.